Protein accounts for 20% of your body weight. This nutrient is essential for the proper functioning of the human body. In fitness and bodybuilding, protein supplements help build muscle, boost your immune system, and increase your strength. They also provide your body with amino acids and other essential compounds that support muscle growth and recovery. Protein powders and bars can successfully replace a meal. These products keep you full longer and reduce hunger. When combined with intense workouts, they help build and preserve muscle, aid in weight loss, and increase your energy. How much protein you need depends on your goals. If you want to become stronger and gain muscle, you should have 1.2 to 1.7 grams of protein per day for each kilogram of body weight. Supplement manufacturers recommend a daily protein intake of up to 2 g/kg/day for physically active individuals. However, it’s safer to keep your protein intake under 1.7 grams/kg/day. The current recommended level of protein intake (RDA) is 0.8 g/kg/day. Athletes, bodybuilders, and active individuals need higher amounts of protein to cope with strenuous exercise and speed up recovery time between workouts. How Often You Should Eat Protein to Build Muscle? It’s recommended to have protein before and after working out as well as before bedtime. When you wake up, your body is in a catabolic state. A protein shake will boost your energy and prevent muscle loss. It’s extremely important to have protein post workout (within 30 minutes) to help your muscles grow and recover. Casein protein is ideal before bed because it’s slowly released into the body. You can have as much protein as you wish as long as it fits into your macros. Should I Drink Protein Before Or After Workout? For optimal results, you should split your dose of protein, eating half 30 minutes before exercise and the other half 30 minutes after. If you’re on a tight budget or want to keep your protein intake to a minimum, drink protein after your workout. Weight training breaks down muscle, which is why you need protein and amino acids to recover after exercise. Certain proteins are absorbed fast, while others take a long time to digest. Protein metabolism differs from one person to the next. Some people only need 20 grams of protein to stimulate muscle growth, while others have higher requirements. The best thing you can do is to calculate your macros and split your daily protein intake into multiple servings throughout the day. Consume more protein before and after training. What Kind of Protein Do You Need? • Whey isolate is one of the fastest absorbing proteins. It’s ideal for low carb diets as well as for people who want to lose fat. Whey isolate can be consumed when cutting before a competition. • Whey concentrate it’s less expensive than whey isolate. It may cause bloating and digestive problems. Whey concentrate protein makes a great snack and can be used before and after training. This type of protein is not recommended at bedtime. • Casein is slowly absorbed into the body and takes up to 7 hours to digest. For optimal results, have casein protein before bed. This will help you stay anabolic throughout the night. • Hydrolyzed protein has the highest absorption rate and doesn’t cause digestive problems. It’s the best type of protein but comes with a high price tag. It can be used pre and post workout. • Soy protein is perfect for vegetarians and vegans. It contains significant amounts of arginine, glutamine, BCAAs, and isoflavones. Athletes can have soy protein shakes before and after exercise. This type of protein is not as effective as whey protein and may cause acne. It also increases estrogen levels, which can interfere with muscle growth. • Egg albumin is rich in amino acids and can be used anytime throughout the day. This type of protein is rarely available in powder form. • Milk protein isolate contains both whey and casein. It’s an excellent source of amino acids. This type of protein can be used pre and post workout. Most bodybuilders and athletes prefer whey protein for building muscle. Whey protein is suitable for those who want to lose fat too. Whey/casein blends support muscle growth and recovery as well. How Much Protein Should a Diabetic Eat? High-protein diets are beneficial for diabetics since the daily carbohydrate intake is reduced. People with diabetes can eat just as much protein as anyone else as long as their kidneys are healthy. Should You Have Protein after Cardio? Whether you want to lose weight or build muscle, you should have protein after cardio. Protein will help your muscles recover and prevent catabolism. Both protein shakes and protein bars provide your body with essential nutrients. Protein bars usually contain more calories and carbs than protein powder. They also provide more protein per serving. It’s a matter of personal choice. Most athletes prefer protein shakes because they are easier to digest, have a higher absorption rate, and provide fewer calories. Can You Eat Protein Bars without Working Out? You can eat protein bars without working out as long as they fit into your daily macros. Protein bars are high in calories. Just like any other food, they can lead to weight gain when consumed in excess. Can You Eat Protein Bars while Pregnant? Protein bars are safe for pregnant women. Can You Eat Protein Bars before a Workout? It depends on your goals. Protein bars will give you the energy needed for intense workouts. However, if you exercise in the morning and want to lose fat, you should either choose a protein bar with little or no carbs, or have a high-protein snack. If you have a protein bar that contains lots of carbs and then you do cardio, you’ll basically burn the calories ingested instead of emptying your glycogen stores and burning fat. Can You Eat Protein and Carbs Together? There is no scientific proof that eating protein and carbs separately aids in digestion or weight loss. As long as they fit into your macros, you can have both at the same meal. Let’s take weight gainers as an example – these supplements contain both protein and carbs. They are ideal for muscle growth and development. Actually, it’s recommended to have protein and carbs post workout. Should You Eat Protein at Night? If you want to build muscle and prevent catabolism, you should definitely eat protein at night. This will help your muscles recover faster and provide your body with essential nutrients. Can You Eat Dry Protein Powder? Not many people have this habit, that’s for sure. 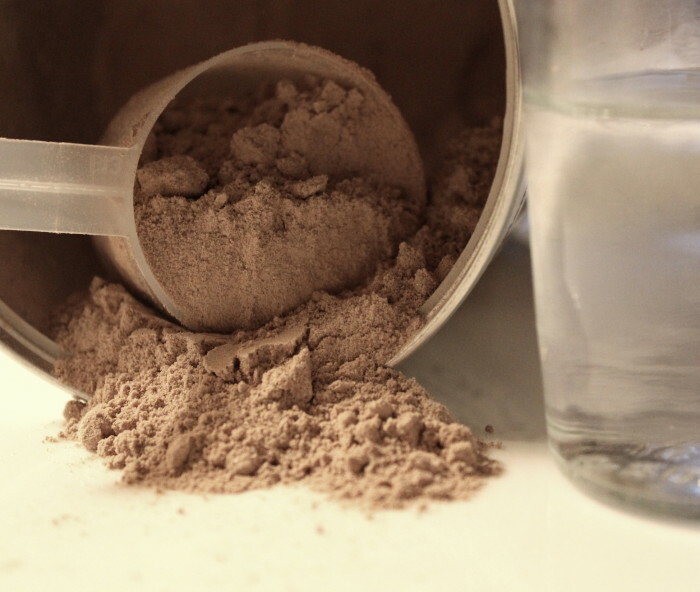 You can eat dry protein powder, but it may not be as efficiently absorbed into the body as a regular protein shake. It could also cause bloating and digestive problems. Should You Eat Protein Every Day? Whether you exercise regularly or have a sedentary lifestyle, your body needs protein every single day. Should You Eat Protein for Breakfast? Having a protein-rich breakfast is the best thing you can do for muscle growth and fat loss. Start your day with a protein shake or have a meal rich in protein. Should You Eat Protein When Cutting? Protein supplements promote fat loss and help build muscle. If you’re cutting, choose high-quality protein powders and drinks with little or no carbs. Eating too much protein may cause kidney problems, digestive issues, heart disease, and weight gain. It can also cause dehydration if you don’t drink at least a half gallon of water per 100 grams of protein. Excess protein is converted into glucose and stored as glycogen, which leads to weight gain. What Happens If You Eat Too Little Protein? If you eat too little protein, you may experience muscle loss, lack of energy, fatigue, hair loss, and skin problems. In general, most people consume too much protein. Should You Eat Protein for Weight Loss? Low carb, high protein diets support weight loss, reduce water retention, and help preserve muscle. If you want to lose fat, increase your daily protein intake and limit your carbs. In addition to protein supplements, the best protein sources are eggs, chicken, salmon, fish, beef, dairy products, nuts, seeds, and legumes. Should You Eat More Protein Than Carbs? It depends on your goals. If you want to build muscle, you need both protein and complex carbs. To lose fat, reduce your daily carb intake and have more protein. What about Whey Protein and Lactose Intolerance? Most whey protein powders contain digestive enzymes that break down lactose, which makes them for individuals with lactose intolerance. Some brands contain little or lactose at all. Whey protein isolate has less than 0.1 gram of lactose per tablespoon, so it’s safe for most people.